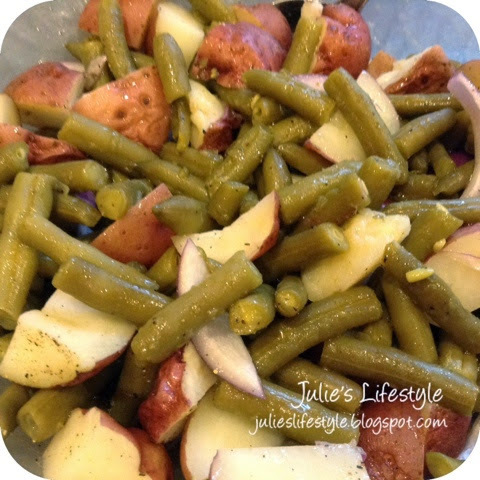 How would you like an easy recipe to make Green Bean Potato Salad for your next dinner or BBQ? Well I have an easy recipe that tastes great and can be made fast. I make this during the spring and summer months and my family loves this dish. Add cut up potatoes and put into a microwaveable bowl with one tablespoon of water. Put the potatoes on potato setting in the microwave and cook until done. Let potatoes cool. Put in a large bowl 2 cans of drained string beans, potatoes, red onion, salt and pepper, vinegar, and olive oil. Mix everything together. Done. See you all here on Monday for my Makeup Monday Series. In case you missed any post you can click HERE. Julie, that sounds awesome! I've had each separately but never together. What a cool combination. Have a great weekend. This looks great. I'll definitely be trying this. Perfect with grilled chicken. Have a great weekend! This looks like a great side dish with some steak or chicken for sure. Pinning it! I make a similar dish by adding ham at the end, very tasty combination!! Thanks for stopping by to add your link to our Party, I appreciate that and I wanted to let you know that I have Pinned Your Photo to our Weekend Party Board, wahoo. Thanks so much for sharing this! I've been thinking about a new summer salad and this sounds delicious and easy! I am so much in love with your blog. Love all your recipes and will try 'em out this weekend. This salad really look so delicious. I am your newest follower from Blog Hop and am following you via GFC, G+, Bloglovin. I will have to try this! 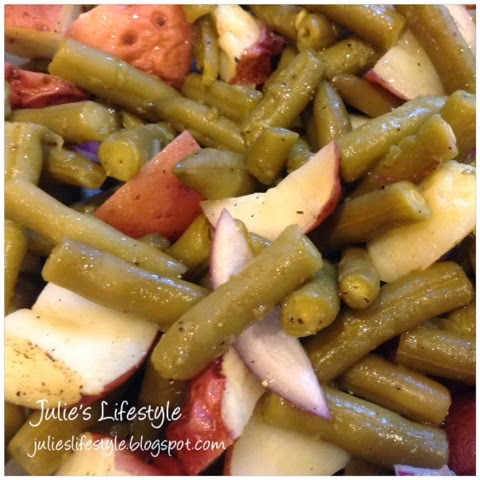 I usually make either potato or green beans salad, never thought of combining them! Definitely curious to try it out. I can definitely see why they love it! It looks filling and delicious! Thanks so much for sharing this awesome recipe with us at the Creative Style Linkup! Hey there again, thanks for stopping by Mondays Reflection, I have pinned your photo to our Mondays Reflection Pinterest board. Wow does this looks great for barbecues and potlucks! I found you over at Back to the Basics. I host Tickle My Tastebuds Tuesday and would love it if you linked up this recipe. I’m sure our party goers would love it as much as I do. Here is the link http://bit.ly/1l4cu0j. Have a wonderful day!! This sounds really good and simple too. I love potatoes and green beans. I will have to try it out. I found you on Tickle My Tastebuds. We'd love for you to link up to our Tips and Tricks link party, starting today, at http://fearlesslycreativemammas.blogspot.com. Julie, this looks so good! I love green beans. Pinning to try! Can't wait to try this one Julie! Yum! Looks delicious! Thanks for sharing at Monday Handmade Linkup party! Thanks so much for linking! Happy Monday! We are going to just love this dish! Thanks so much for sharing this awesome recipe with Full Plate Thursday and come back soon! this recipe sounds great and so easy! Thank you for sharing at Bloggers Brags Pinterest Party!